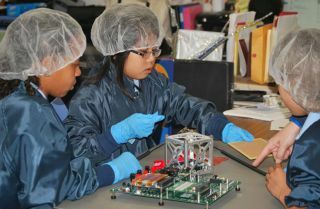 Grade-school students from St. Thomas More Cathedral School in Arlington, Virginia, designed and built a miniature satellite that deployed from the International Space Station on May 16, 2016. On May 16, the International Space Station launched the first miniature satellite, called a cubesat, designed and built by grade-schoolers. The STMSat-1 satellite launched to the space station on Dec. 6, 2015. It was the culmination of a three-year-long project involving 400 students from pre-kindergarten through eighth grade at St. Thomas More Cathedral School in Arlington, Virginia, NASA officials said in a statement. STMSat-1 was deployed from the NanoRacks CubeSat Deployer (NRCSD) system on the space station. The satellite will take photos of the Earth and transmit images to a ground station from an orbit similar to that of the space station, about 250 miles (400 kilometers) above Earth. The students were led by Joe Pellegrino, a deputy project manager from NASA's Goddard Space Flight Center, and they learned how to assemble the spacecraft, operate radios and build the ground stations to communicate with the satellite. The children took part in all of the aspects of construction, from circuit design to soldering electronics. St. Thomas More students watch their cubesat deploy from the space station. The cubesat flew as a part of NASA's CubeSat Launch Initiative, which gave 16 organizations an opportunity to build cubesats destined for orbit. The selected cubesats received launch opportunities as part of NASA's Educational Launch of Nanosatellites (ELaNa) IX mission, which provides access to space for cubesats developed by the NASA centers and programs, educational institutions and nonprofit organizations. The mission enables developers to conduct space research at a lower cost than they'd otherwise be able to, according to NASA. The students' satellite is in good company. Other cubesats on this mission included a miniature satellite from the University of Michigan that will study the upper atmosphere, and a solar flare study designed by a team at the University of Colorado Boulder. Since 2010, the ELaNa program has selected more than 100 cubesats and has launched 46 of them. The miniature satellites were chosen from responses to public announcements on NASA's CubeSat Launch Initiative. NASA will release another call for proposals in mid-August. You can Follow Jesse Empsak @Mad_Science_Guy. Follow us @Spacedotcom, Facebook or Google+. Originally published on Space.com.